On the surface, the Ichimoku seems like a rather complicated charting tool. It is however fairly easy to use once you get to know it. 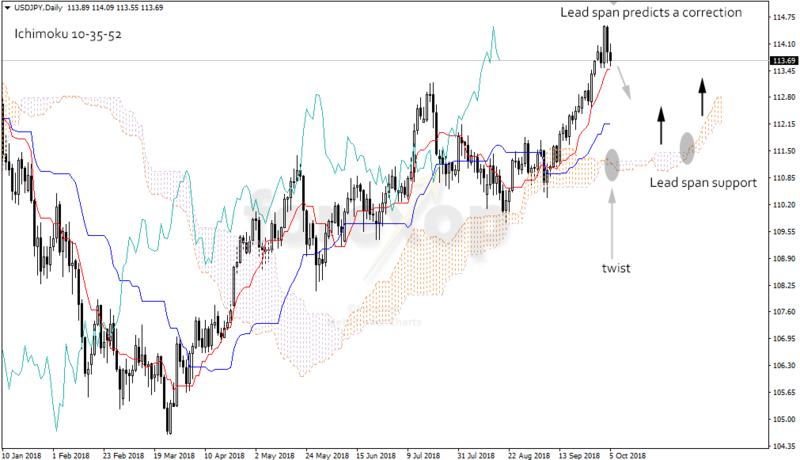 One of the smart things about Ichimoku is that it has a predictive element called the lead. This allows you to look ahead into the future, which many other indicators do not allow. 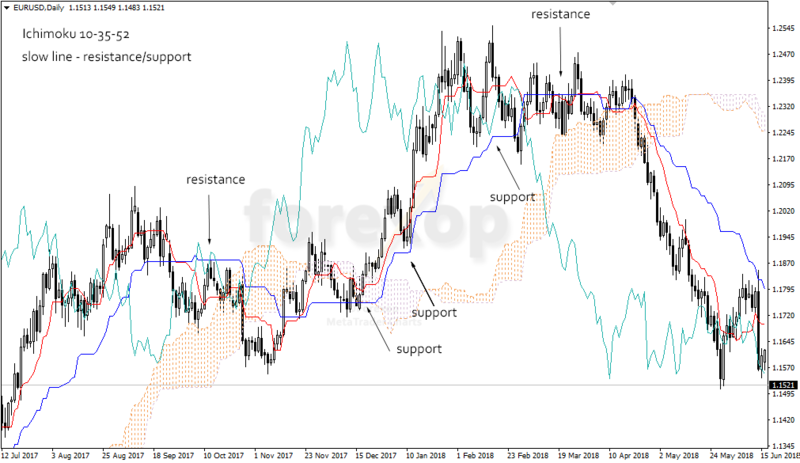 The two output, or equilibrium lines of Ichimoku can help you to examine past areas of support and resistance. However, more usefully they can help you to predict where areas of support and resistance are likely to develop in the future – at the front of the chart. The equilibrium lines use the price’s recent low and high watermarks to derive their outputs. This makes them good at identifying price extremes and these are places that resistance and support is likely to arise. This type of analysis is ideally suited to trends. Both up and down trends will usually have some corrections that rise or fall against the dominant direction. These are pullbacks. 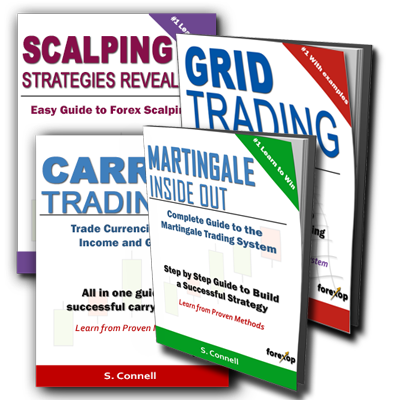 The equilibrium lines help the trader to predict how far these pullbacks will go. 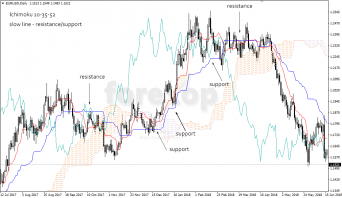 This makes Ichimoku a useful analysis system for several strategies most notably trend trading and swing trading. See the example chart below. When setting the indicator, the slow line (Kijun sen) is commonly set between about 30, 40, and the fast line (Tenkan sen) about 8 or 15. In the example, the settings are 35, and 10. The simple rule to remember is that when the price is above the slow equilibrium line, expect that area to produce support to a falling price. When the price is above, expect it to produce resistance in that area to a rising price. According to Kumo theory, the flatter the line is, the stronger the support or resistance is likely to be at that instant (see here). In the chart example, the slow line is blue. The bullish area of the chart shows that the blue line marks the areas where the price rebounds off the lows – the trend support lines. In the opposite direction, we can see that when price is below the blue line, it now represents an upper resistance zone. With live trading, you will never have the opportunity to see the chart ahead. As with almost all other indicators, we can only see where the lines are right now. From that we can only guess as to where support and resistance might be in the future. This is where Ichimoku’s lead span or cloud comes in useful. While the lead span obviously cannot see into the future, it does anticipate it from historical price patterns. This is in an effort to estimate where the price could go a few steps ahead, which is what we want to know. The cloud is a little tricky to read at first because it extends ahead to the front of the chart. The easiest way to think of it is an attractor that will draw the price towards it. If the cloud is rising ahead of the current price, expect the price to move higher. If the cloud is falling ahead of the current price, expect it to move lower. The chart in Figure 2, for USD/JPY daily demonstrates. The first thing to look at is the front of the chart where the lead span has two crossovers known as twists in Ichimoku terminology. The first represents a turn from bullish to bearish, and the second is the reverse. Therefore, the lead span is predicting a pullback followed by a recovery. The price is trading above the kumo cloud and the slow equilibrium line. That means we should expect these levels to produce an area of support to any price fall. We can use this information for setting stop losses. The first level is around 112.84, the second at 112.17 and the third and lowest at 111.46. These will help should we want to trade short on the pullback, or to enter the trend long on the recovery. Ichimoku is not the most intuitive of tools, but once you grasp the basic idea, it can be a great asset in technical chart analysis. Unlike most other charting systems, the Ichimoku has an output that projects into the future and this helps to predict the path of the price.